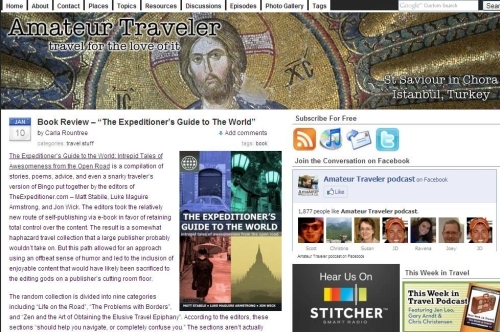 Thanks to Amateur Traveler for their review of The Expeditioner’s Guide to the World at their site this week. Many of you are probably active listeners to Chris Christensen’s Amateur Traveler podcast, which at last look was the number five podcast in iTunes’ “People and Places” category (damn Rick Steves was just ahead at number 4). Of course, you can always check out the book and purchase either the paperback or e-book version at Amazon by clicking here.